Pink is feminine and pink is power. 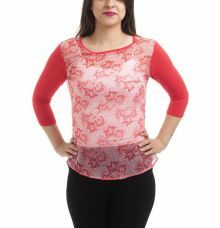 Bring this super stylish top to your wardrobe and look your feminine best. The ruffle design adds to its girly look. Made from georgette it features U neck and sleeveless style. Team it with jeans or mini skirt for a gorgeous look.